They&apos;re old, they&apos;re gray, they steal carbon from the air, they block the sun, they buckle the sidewalks... and they&apos;re so ridiculously green it&apos;s almost like they&apos;re showing off. 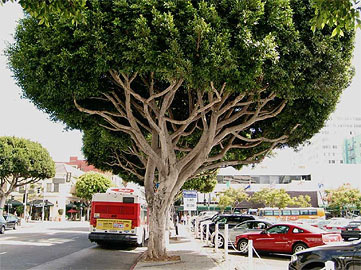 They are the 50+ ficus trees who have the nerve to stand in the way of progress near the 3rd Street Promenade. And they&apos;ve got to go. 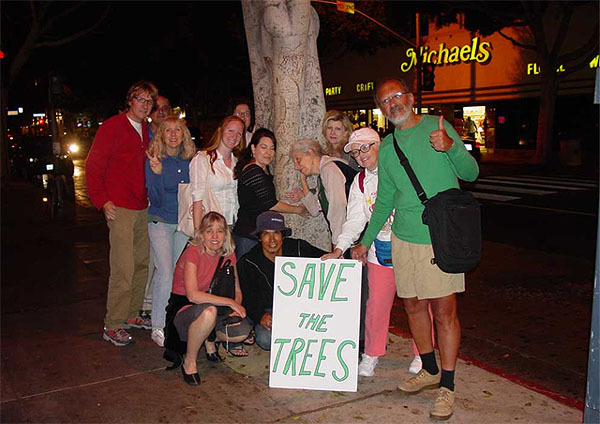 In order to expand the popular shopping district (once known as the Santa Monica Mall), city officials have decided that it would be best to uproot over 30 elderly ficus trees, and destroy over 20 of them, probably out of principle. Sure Santa Monicans unload their wallets at Whole Foods, putter around in their hybrids, and pretend to vote liberal, but when it comes right down to it, they hate nature, they hate the environment, and they really can&apos;t stand ficus trees - especially when buses and trucks scrape up against them. How do we know this? Because there&apos;s only one Santa Monica councilman who gives a twig about the old trees, Kevin McKeown, and even he thinks the future for the trees looks dark. To revisit the plan — which has been in the works for a decade — a council member on the prevailing side would need to place the item on the agenda, an unlikely scenario, since City staff has warned that changing the project could jeopardize the earmarked State and Federal Transportation funds, McKeown said. The uprooting begins Monday. Happy Columbzzzzz Day. The Times today quoted activist Jerry Rubin who admitted that the ficus are not people "but if they were, they&apos;d probably be shouting &apos;Don&apos;t relocate us, don&apos;t get rid of us before our time!&apos; "
Too bad for Jerry that the city council are people, and they&apos;re about to shout, "gentlemen start your chainsaws." Somehow an emergency meeting has been called by the Treesavers tonight on the front lawn of the Santa Monica City Hall. 1685 Main Street, 6:00pm. The trees don&apos;t stand a chance. Not even the LA Green Girl is that into saving them. In Santa Monica the only way an "emergency meeting" would get the people behind it is if someone threatened to ban Starbucks or BMWs. That&apos;s not a city that cares about trees. They care about having a nicer Banana Republic. Or another place to get shoes. Or encroaching into Venice some more. If you can&apos;t see that a new Baby Gap opened on 4th Street because an old tree is in the way, Santa Monica would be likely to just crumble into the sea. Nobody wants that. Those ficus should make like a tree and leave.